DARLINGTON SENIOR Seth Johnson shot an 89 at Thursday’s sectional. 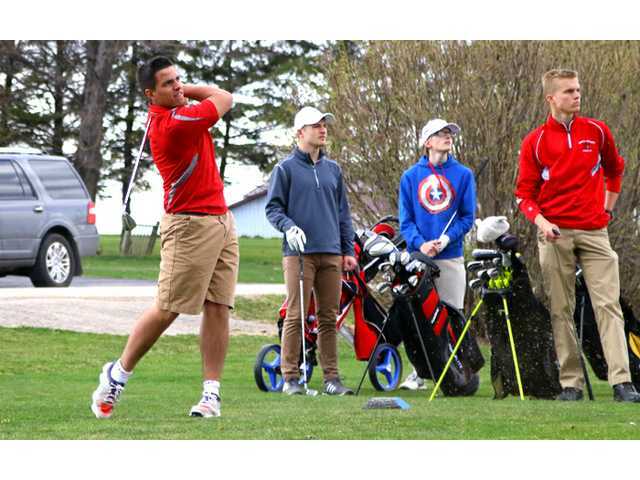 POSTED June 8, 2018 9:43 a.m.
NEW GLARUS – Darlington’s Seth Johnson wrapped up his senior season and his prep golf career with the Redbirds by finishing in 32nd-place overall at the 2018 WIAA Division 3 Sectional Boys’ Golf Meet held at the Edelweiss Chalet Country Club in New Glarus on Thursday, May 31. The meet was delayed a day due to an early morning rain storm on Wednesday, but went off without a hitch the next day under near-perfect conditions. Johnson carded a round of 89 in his first career sectional appearance, scoring a 42 on the front nine and tallying a 47 on the back nine, to end up in a tie for 32nd-place at the meet. Abundant Life Christian/Madison Country Day won the sectional team title with a score of 335. Host New Glarus finished just a stroke back at 336 to nab the other state team berth. New Glarus junior Matt Hach shot a six-over 78 on his home course to win the individual sectional championship title on the day. Coulee Christian/Providence senior Joshua Johnson shot a 79 and Wisconsin Heights senior Anil Jergens followed with an 80 to earn the first two individual state berths. SWAL rivals Mason Holcomb, a senior from Argyle/Pecatonica, and Cole Needham, a senior from Fennimore, had to battle it out for the final state berth after tying for fifth-place overall at 81. Holcomb defeated Needham in a playoff to earn the final state spot.